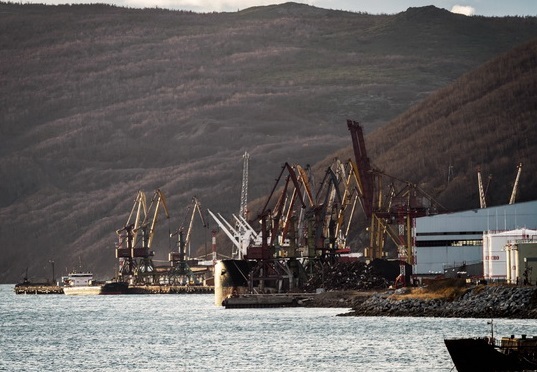 Magadan Commercial Sea Port start reconstruction and development after received state financing for renovation of two berths and ordering modern cargo handling equipment. The terminal was visited by Deputy Transport Minister Valery Okulov, governor of the region Vladimir Pechyony and CEO of the port Andrey Gorbov. During the working visit was approved state financing for the renovation of two berths, which will make the port competitive and operations more efficient. The reconstruction of the two quays will allow faster cargo handling process, which will support the increasing of turnover of the port. “Two from the quays are in urgent need of renovation. They need also new cargo handling equipment”, said the CEO of Magadan Commercial Sea Port, Andrey Gorbov. “We already purchased two cargo cranes at worth 10 million USD, but not is necessary to reconstruct the berths, which will allow faster and more efficient processing of the cargo”, added he. “The spending of the funds will be done through tender for construction of the berths”, also added Andrey Gorbov. The state financing will be done within the framework of the federal target program “Development of the Far East and Transbaykal until 2020”. The program has worth of 1.2 billion rubles, as for the reconstruction of berths in 2016 will be provided 500 million rubles. Magadan Commercial Sea Port is located in the Nagaevo Bay on the northern coast of the Sea of Okhotsk. The port has 13 berths, of which 3 are for oil products, container 2, and 8 for other goods.